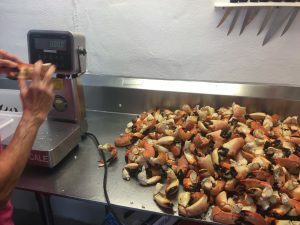 We primarily process Stone Crab Claws at Kirk Fish and are HACCP certified to process them. Season runs from October 15th through May 15th. 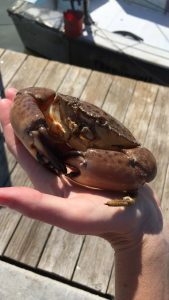 The fishermen are responsible for making sure the claws are of legal size and correctly harvesting the claw from the body. 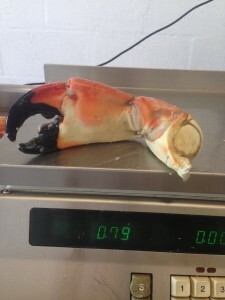 Stone crabs will begin to re-grow a claw within 30-90 days. 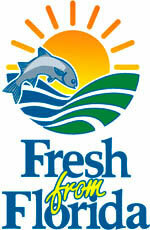 We have several commercial fishermen that go out daily and bring us their catch. 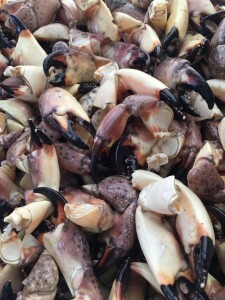 Once the raw (“green”) claws are weighed, they are cooked, cooled, graded, and ready to sell by the next morning. We grade them into four different sizes: medium, large, jumbo, and colossal. We have found the meat-to-shell ratio gets better as the claw gets bigger. 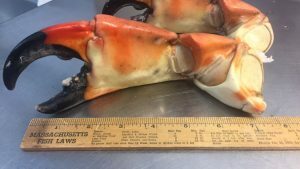 This means larges stone crab claws cost more than medium, but you get a little more meat and do less work to get to the meat. 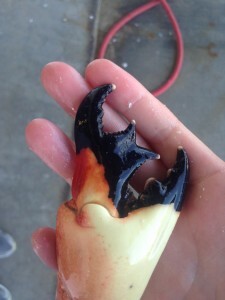 Occasionally, you’ll find a disfigured claw. 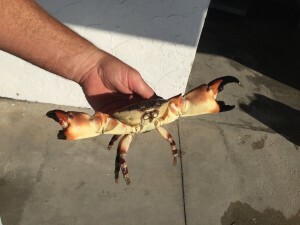 There is nothing wrong with the meat, sometimes they just grow back with an extra claw or a bump in it. 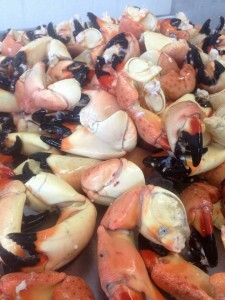 Stone crabs claws are a renewable resource because the fishermen do not kill the crab when they harvest the claw. 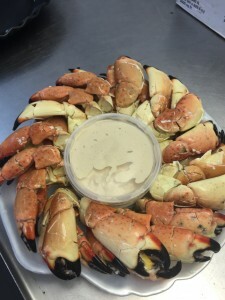 Most people enjoy their stone crabs cold with a little of our homemade mustard sauce or with melted butter. 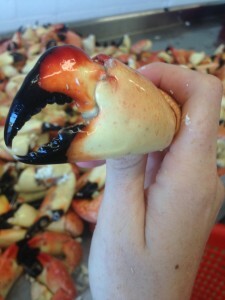 Stone crabs can be warmed prior to cracking and eating by steaming them in an inch of water for 1-2 minutes. 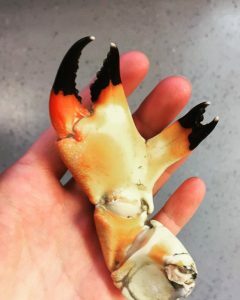 We are happy to give you crab cracking lessons, or even crack them for you if you plan on eating them within a day or so. 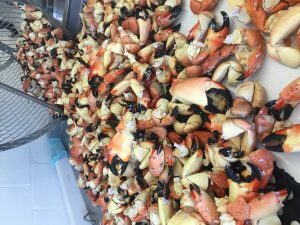 Your stone crabs are fully cooked and fresh, never frozen. 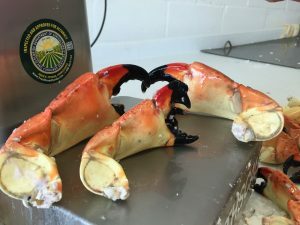 If we crack the claws for you, they can be kept in the package we give them to you in for up to 2 days in the refrigerator. It is not necessary to put the claws on ice if they are in the refrigerator. 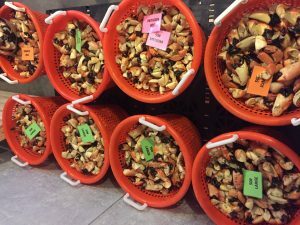 Uncracked claws can be stored in a colander or open container in the refrigerator for up to 7 days. 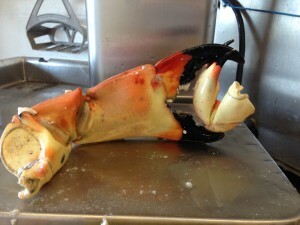 Once the claws are cracked, they should be eaten within a day or two only because the meat will start to dry out. 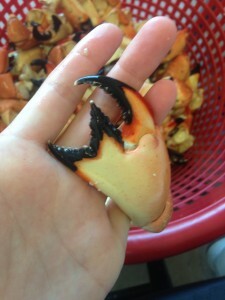 If you would like to freeze them, purchase uncracked claws, rinse well and put in a freezer Ziploc bag. 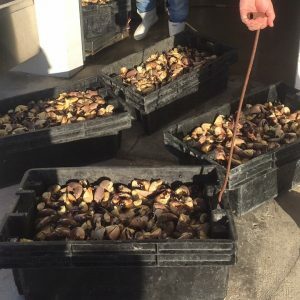 Remove as much air as possible and place in freezer, they can stay frozen for up to 6 months. 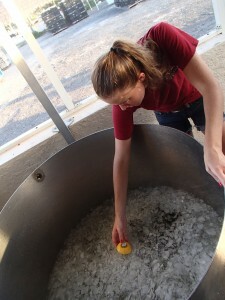 The secret to frozen stone crabs is the thawing process. Take out of the freezer and put in a colander or bowl in the refrigerator a full day before you want to eat them. This slow-thaw method returns the claws to the best quality. Cracking the claws requires a wooden mallet or the heavy end of a butter knife. Hitting them once on each side of the claw and once on each knuckle with a “pop” will crack them. “It’s all in the wrist” Dip them in your mustard sauce or melted butter and enjoy! If you prefer claws warm, purchase untracked claws and steam for 1-2 minutes. Be careful to not overcook them. Follow the instructions above to crack and enjoy. Note: many people have found microwaving cracked claws in 30 second intervals warms them perfectly also. You can also take them out of the refrigerator 30 minutes before serving to let them come to room temperature if you don’t want them ice cold.